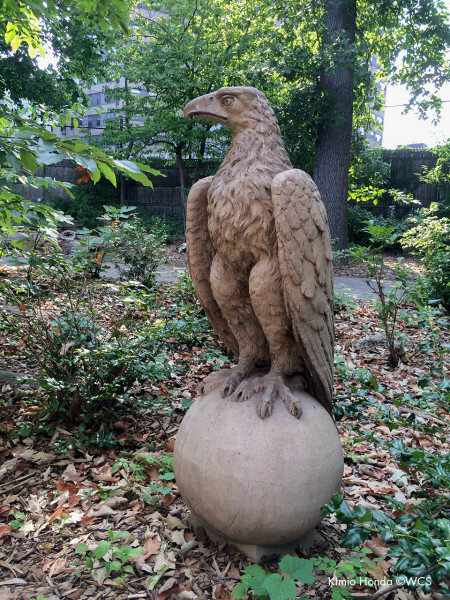 Beyond the eagles I described in my previous post, there are a few other, though less visible, eagle sculptures at the Bronx Zoo. These belonged to the building behind the current Birds of Prey exhibit that was originally known as the Winter House for Eagles, built in 1912. (You can see original plans for the building on the NYC Design Flickr page.) Curator of Birds William Beebe took the building as a research space as early as 1914, and it later served as the headquarters for his Department of Tropical Research. The Beebe Lab, as it was known, later became the office for the Publications Department, and house now Digital Programs and Media Production. The Winter House for Eagles had its own pair of eagle sculptures on its rooftop, watching over each entrance, but it seems that people didn’t pay much attention to them. The building has been an office building after all and mostly out of public sight, even more so since the animal exhibits behind the Birds of Prey and the Aquatic Bird House were closed. 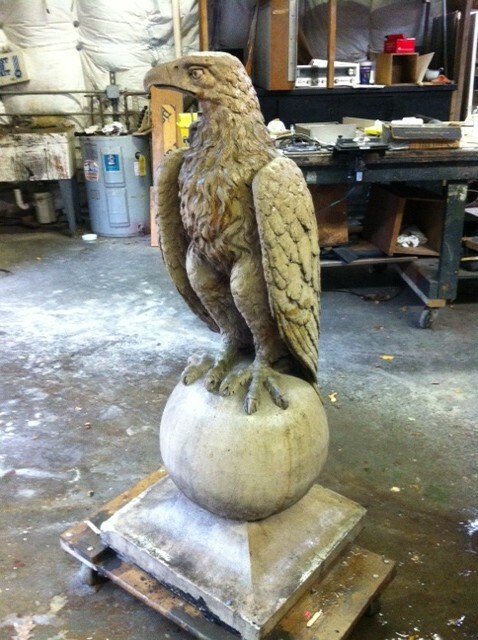 The following is what Gary Smith wrote to me about what happened to these eagle sculptures. Gary is Assistant Director, Exhibit Production, and has been the head of our Exhibit Shop for many years. 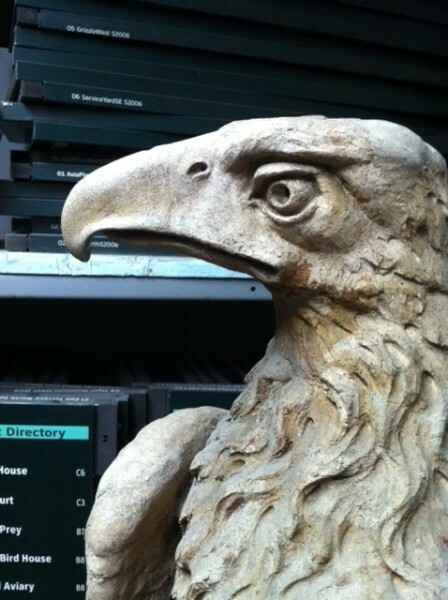 “In 2004, we had recovered an entire smithereened eagle that had blown off the roof of the Beebe Lab in a storm. Matt (Aarvold, the long-time second-in-command of the Exhibit Shop) painstakingly reconstructed that one, and it now sternly gazes at pedestrians approaching the LaMattina Animal Ambassador Center. A few winters ago, Yvetta (Pokorny, retired now as a senior keeper in the Ornithology Department) saw a piece of eagle-like terracotta under the leaf mold by a corner of the Beebe Lab. 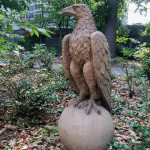 She told us about it, and Matt and I were able to dig around and recover most of the pieces of a smithereened eagle statue that had graced a corner of the Beebe roof. We never found the head, and the pieces we were able to find that winter languished in the shop until the summer of 2013, when our summer intern, Ada Blecher, was able to reconstruct it, minus the head. When they are not playing the 3D puzzle of sculpture restoration, the Exhibit Shop artists create incredibly faithful replicas of natural environments that fool the eyes of people and animals alike. These elements often perform double duty of hiding man-made structures and equipments. It is an extreme privilege to be able to work side by side with such dedicated and talented artists.